Some of us do a lot of copying and pasting during an average day, and from time to time the standard Windows clipboard simply does not cut it. Whether you need to go back and access an item from quite a bit ago, want to save clipboard items for later, or simply want to view access all your clipboard items from one screen, finding a program that helps you out might be fairly important. For those looking for such an option there is Spartan, a free program that has just recently been released to help organize your clipboard and streamline the copy and paste process. To download, swing by this website and grab it, but be prepared: Spartan features an utterly antique install interface. Do not worry – it has absolutely nothing to do with the program itself. Just enjoy feeling like your running Windows 95 for a moment. Starting up the program greets you with a blank matrix of cells with 25 yellow cells in the left column and 25 white on the right. As you start copying things you will find that they all seem to appear on the left. This area is the temporary clipboard, the one just like everyone has, albeit a slightly extended one. Now before you do anything else you need to know that, by default, the program makes a really annoying dinging sound every time you add something to the clipboard. If you are ok with this then feel free to read forward, but if it drives you crazy go to Tools > Options (General) and find the little box that says Sound when new clips are captured. Uncheck that box or suffer from the most obnoxious dinging sound ever. Go ahead and load a few items into Spartan simply by copying a bunch of sections of text or images. Nothing has changed here – do it just like you normally would. Once you have a selection of items to play with, experiment a bit to better understand how the program works. Spartan automatically saves anything you leave in the right column, making it available until you either tell it to forget it or you uninstall the program. You can see this by dragging one or two items into the right column, completely exiting the program, and then opening it back up. You may notice that it saved the items on the left as well – these stay intact until you replace them with new items, and Spartan drops off old items to make room for new ones once you have reached your limit of 25. Also notice that as you mouse over images in the Spartan matrix, previews of those images appear in a small window that disappears as you move your mouse away, allowing for quick and easy identification between similarly titled images. When you actually want to use one of the objects further back in your clipboard simply leave the cursor where you want the item to appear and then click on the field containing that item in Spartan. It appears just as would a normal clipboard item and leaves you ready to go. Some people will likely find the program too similar to the standard clipboard to find it worth the download. Others, however, will see value in the quirks provided through Spartan and will boost their productivity through it. If you are on the fence, you might just want to give it a try – it can be surprisingly helpful. 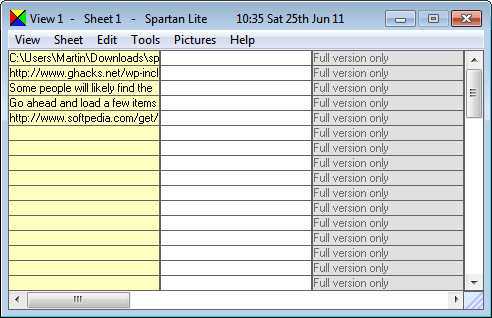 Spartan Lite is offered as a free and portable version. The commercial version of the clipboard manager can store more clipboard entries than the lite version, but that seems to be the only difference. I find Ditto to be a much better clipboard manager. No limit on the number of items it can hold. Completely free to use. I tried it. It was really awful!